UPDATE 10/08/2016: One (1) teaser screenshot for the the next build, showcasing ship welding. I never said your ship would look pretty. You are the AI adjutant of the 'General Purpose Machine' MUTEKI. After a failed defense of the planet Earth, your ship is catapulted into an unfamiliar galaxy teeming with scrappers and triads who'd like a transistor-level view of your head. Use your GPM to assimilate parts of enemy ships and/or innocent bystanders, build a big chugging unbalanced war machine, plow through heavily-armed police fleets and find a way back home. ...or at least, that's what you'd do if the game were anywhere near done. This physics sandbox demo showcases the advanced 'free cutting' damage system, which lets you carve up enemies any way you like-- they'll break apart dynamically, and orphaned equipment modules will cease to function. In the next demo, you'll also be able to attach them any way you like. With free scrap placement and the already-implemented automatic thrust balancer, MUTEKI aims for a more spontaneous and visceral experience than similar offerings. 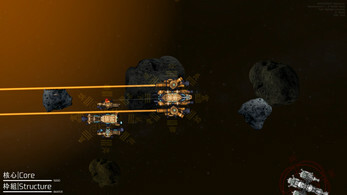 Heavily inspired by Battleships Forever, its damage system could be considered the logical conclusion of that game. Using "Starfield stock" by Smatilla ( http://smattila.deviantart.com/). ...and anybody else I may have missed from the Wyrdysm Games forums. Used without permission. If you want me to take this down, just shoot. Thanks for your interest. A big update is in active development; it'll be the first 'game-like' build instead of being a tech demo. As such, you should expect to see a survival-style game mode with rudimentary menus for control mapping and graphics. As of last week, the functionality for stealing stuff from NPC ships is more-or-less ready. 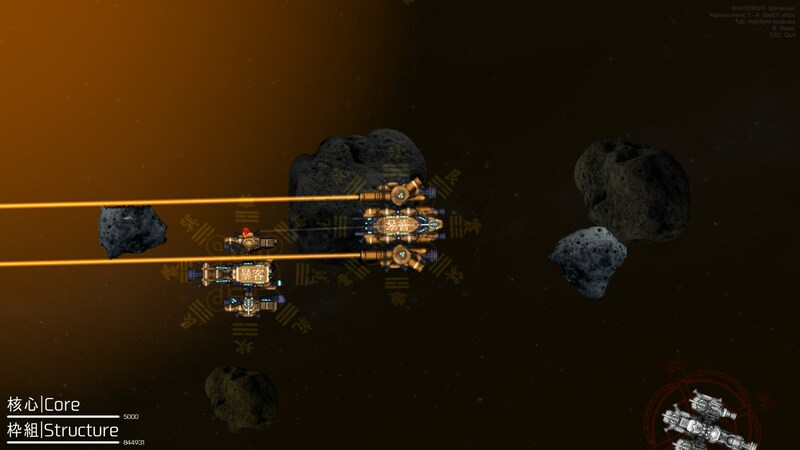 Currently, I'm developing a formation-based NPC AI that will form the backbone of space combat. Instead of coming at the player in masses or waves, they'll exercise caution and force coordination commensurate with a threat like the monstrous General Purpose Machine. Also in the works is a "toy" astrophysics implementation that seamlessly integrates realistic phenomena like moving planets and Hohmann Transfer-esque maneuvers with 'arcade'-style flight physics. Don't expect it to see it in the next build, but it's a thing that's happening eventually. 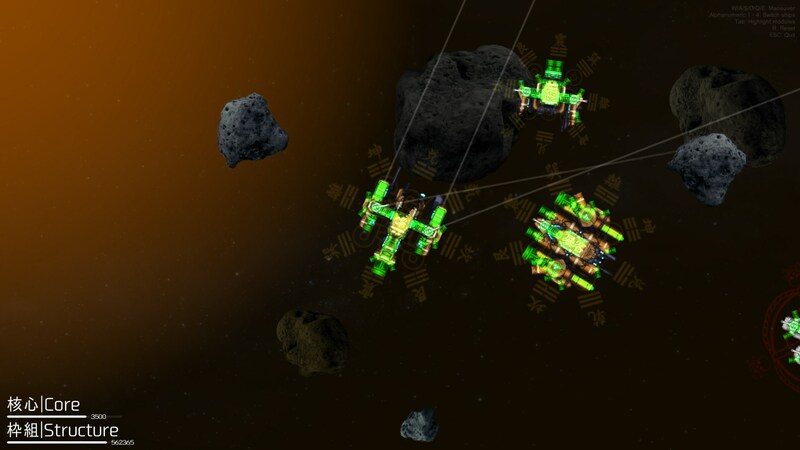 As for resource mining, there are plans to add a heavy 'kernel' to asteroids that make them impractical to use as armor, but which yield raw materials if destroyed. It's certainly not intended to be a main method of progression; "ratting" and wanton piracy are more the game's style. Whatever the case, there'll be a new demo on September 8th or 9th with everything developed up to that point. See you then! There's certainly more to it now, but it's never been ready for release as anything more than a tech demo. I want it to reach a stage where it's actually enjoyable before I put up a new demo.